One of 23 examples of paid political cartoon ads featured in a new Arkansas Historical Quarterly article by Janine A. Parry and Dusty Higgins. Candidates and parties paid to place hundreds of these in newspapers across the state between about 1940 and 1970. The latest issue of The Arkansas Historical Quarterly includes an examination of the one-panel cartoons ads that dominated Arkansas politics in the mid-twentieth century. The project's authors have excerpted the article and cartoons into a publicly-accessible slide show. Political science professor Janine Parry co-authored "Arkansas's Campaign Cartoon Advertisements, 1942-1970" with a former student Dusty Higgins, a graduate of the University of Arkansas's art program who now works as an illustrator and digital arts instructor at the University of Arkansas at Little Rock. 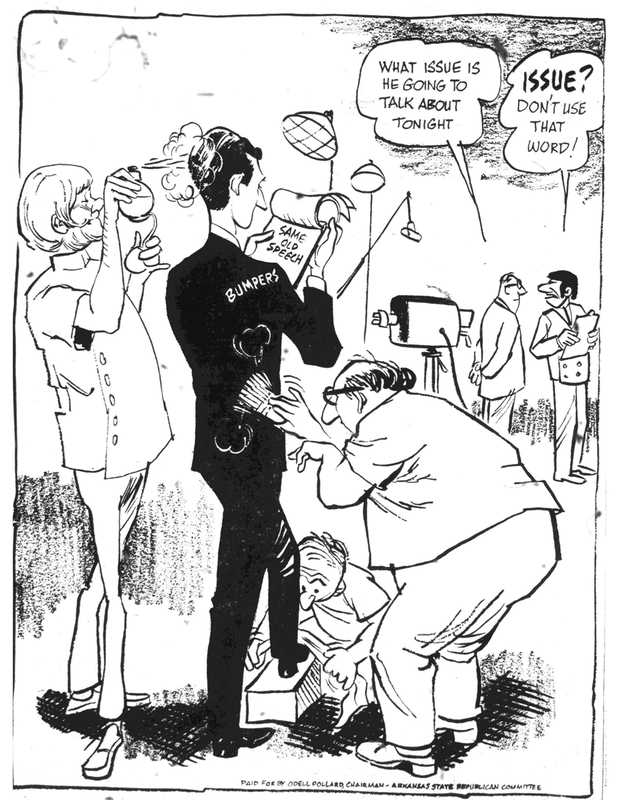 Higgins received the Mark of Excellence in editorial cartooning by the Society of Professional Journalists in 2003. In postwar Arkansas, hundreds of original, bitingly satirical political messages appeared as paid cartoon ads in the state's newspapers during election season. Peaking in the 1960s, it has been decades since Arkansans have seen cartoon-style advertisements, but they used to be as familiar as today's television spots. Arkansas's experience with cartoon campaign ads probably was unusually rich, according to the authors. Although cartoons were used in campaigns elsewhere—including sequential art treatments on behalf of presidential candidates Herbert Hoover and Harry Truman—Parry and Higgins propose that it likely remained a common practice decades longer in Arkansas than elsewhere because television was slower to emerge as the central form of political communication. Although the ads were not signed, the available record suggests most can be attributed to the two best-known Arkansas editorial cartoonists of the twentieth century, Jon Kennedy and George Fisher. Kennedy drew for the Arkansas Democrat for almost fifty years, Fisher for the Gazette. From the 1940s through the 1960s, both artists moonlighted for parties and candidates using the same single-panel cartoon medium they used at the newspapers for which they worked, a practice anathema to later journalists' professional ethics, but acceptable - even expected - at the time. The 23 cartoons featured in the slideshow tell us a lot about the state's politics at mid-century, Parry said, making them lively additions to the Arkansas Politics course she has taught for more than 20 years. "But it was Dusty's eye as a cartoonist that added a special twist to this project," Parry added. "He worked with other professional cartoonists to determine which artist was likely to have penned each cartoon." Regardless of which artist was drawing for which candidate or cause, Parry added, "the cartoons strike a populist note, urging voters not to be manipulated by Arkansas's political powerbrokers. That's the central way that these cartoonists - and the campaigns that hired them - left us a rich record. We're thrilled finally to share it with others."